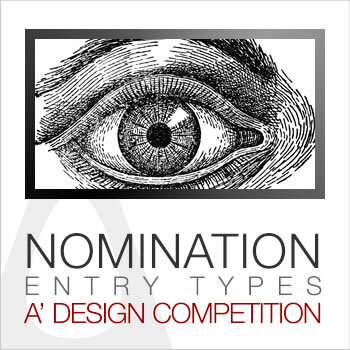 This page provides a list of possible A' Design Award & Competition entry nomination types. A’ Design Award and Competition has developed several “Entry Type” mechanism after an extensive study on the needs of different partakers of the competition such as enterprises, agencies, design professionals, non-profits, academia, young talents, start-ups, media and government representatives. Based on this study, eight different entry-types were developed. These types are Professional Edition, Digital Edition, Platinum Edition, Red Entry, Golden Entry, Platinum Entry, Black Entry. Each of them are explained below. Please refer to the entry types below to understand which one would suit your needs best. The most common entry method is "Professional Edition" followed by "Digital Edition". The third popular entry method is Black Ticket i.e. "Professional Entry with Express Evaluation"
Professional Edition is usually preferred by pr agencies, media, brands, academics, established businesses as well as professionals while digital entry is more suited towards upcoming talents and start-up companies. The professional edition (Professional Entry) is the most common way to take part in the A’ Design Award and Competition, it is the original value proposition for any participant type to take part in a design accolades. The professional edition covers the full spectrum of A’ Design Prize which includes the Trophy, Yearbook, Exhibition, Certificate, Logo Licensing, Gala-Night as well as PR Services such as Press Release, Design Interviews, International Translations, Media Pitching and more. To learn more about the Professional Edition, you can check out the A’ Design Prize which gives a better understanding of the competition. The Professional Edition was designed based on surveys and research that indicated the needs of competition participants. The Professional Edition was designed to help promote the laureates internationally, to create business opportunities for award winners, to provide media placement and publicity possibilities for awarded designs as well as a way for designers to benchmark their work. Professional Edition Entry Fees are considered when comparing other entry types. The Professional Edition is most suited for Enterprises, Agencies, Professional, Media, Academic, Non-Profit and Government Account Types but can also be utilized by any other participant type without restrictions. Learn more about the Professional Edition by checking the A' Design Prize. The digital edition (Digital Entry) was created especially with young and start-up account types in mind. In short, this is a digital version of the professional edition; this implies that the hardcopy deliverables in the winners’ kit such as the award trophy, the hardcover yearbook, the certificate in metal frame as well as some other benefits such as invitation to join the gala-night, physical exhibition are excluded in order to create a possibility for us to reduce the nomination fees significantly. Given this, the Digital Edition has the same evaluation methodology and the jury members do not differentiate nor know if they are voting a digital edition entry or professional edition entry. This ensures that both entry methods have the same scientific peer-review and anonymous voting evaluation criteria, while decreasing the cost of participation by reducing the deliverable items after the competition. The Digital Edition costs significantly less than the Professional Edition, and thus a great fit for young and start-up companies but also for small businesses, upcoming media publications, newly founded non-profits or any other organization or institution that has a limited budged. Like the professional edition, there are no further fees from the participants. For further information regarding the Digital Edition, please visit the Digital Edition page. The Red Edition (Nomination Ticket) is almost same as Professional Edition. The only difference is the time interdependency; the nomination fees for Professional Edition is effected by the entry period; i.e. if you join earlier you pay less, and if you join last minute, the nomination fee is slightly higher. However using the “Red” Nomination Ticket, for example at “Early-Entry Period”, you can lock the nomination fee, thus you can later, at the “Late-Entry Period” upload and nominate your design. Thus the Red Nomination Tickets are great for any enterprise, agency or professionals who wish to take part in the Professional Edition by investing less resources. When Entry Fees are concerned, the Red edition costs less when bought in advance or as part of nomination packages. Red Edition fees can be significantly cheaper if the Red Nomination Tickets are bought in bulk; A’ Design Award & Competition offers discounted entry possibilities when a prospective entrant decides to make multiple nominations. These are explained in the “Nomination Packages” pages. To learn more about the Red Nomination Tickets, visit the nomination packages and nomination tickets pages. The Black Edition (Black Nomination Ticket, Professional Entry with Express Evaluation) is almost same as Professional Edition with the exception that it also includes the Express Evaluation and Judging service which is usually sought after PR agencies and companies who need to know the results of the evaluation of their works faster than others. When Express Evaluation and Judging Service is ordered, if the presentation score of the entry is high-enough, it will be send to several judges to be evaluated within several days. Given this requirement, the Black Edition costs more than the Professional Edition since jury members shall be contacted and required to vote earlier. If entry fees are considered, the Black Nomination Tickets cost always higher. Professional Edition participants could also order the Express Evaluation Service in case after nomination they would feel the need to learn the results of the evaluation of their entries significantly faster and sooner. Like the Professional Edition, the Black Edition covers the whole A’ Design Prize and winners are given every item and provided each and every service included in the A' Design Prize. To learn more about the Black Edition you could check the nomination tickets page or you could check the Express Evaluation and Judging Service. The Gold Edition (Golden Nomination Ticket) is also very similar to Professional Edition participation, but with the difference that it includes eventual shipment of the winners’ kit. To remind you once again, A’ Design Award & Competitions’ Winners’ Kits which contains the 3D printed metal award trophy, hardcover yearbook and the certificate in metal frame are distributed free of charge during gala-night and exhibition which winners are given a complimentary invitation. However, in some cases, participants would not be able to come to our gala-night or exhibition and ask for delivery of their kits to their homes, offices and work. In this case, A’ Design Award & Competition charges a shipment fee plus an administrative fee which is called the “Delivery of Physical Components of the Winners’ Kit”. The Gold Edition includes this delivery fee prepaid, yet of course participants can still come and join the gala-night or exhibition if they decide so. Since Gold Edition includes the eventual shipment fees, it costs more than the Professional Edition. It is generally preferred by entrants who know they would not be able to join the gala-night in advance and the Gold Edition is especially sought after entrants who get their nomination fees covered by a company or institution, including academic entries. Learn more about the Gold Edition. The Platinum Edition (Professional Entry via Platinum Edition) is a very innovative nomination method by the A’ Design Award & Competition; different from the Professional Edition. It was created as surveys filled by multinational companies, proud designers, high-brand value enterprises, creative agencies indicated a need for the "Silver Risk". It was created for everyone who couldn’t accept any other award status other then Platinum or Gold. The evaluation methodology is the same; the jury members do not know whether you join Professional Edition or Platinum Edition. After criteria based peer-review and anonymous voting, if your entry gets Platinum or Gold result, it would be announced. If your work would get a Silver, Bronze or Iron award, we do not announce your results and void your entry. This especially benefits large corporations who wants to ensure their reputation as the very best in design remains unscratched, but also used a lot by PR agents who do not want to take risks for their clients. The entry fees are relatively expensive for most account types, and costs more for Non-Profits, Academics, Governments, Design Associations, Media, Agencies, and Enterprises. However it costs less for Professionals, Young Entrants and Start-Ups. Learn more about the Platinum Edition. Digital Gift Card Entry method is based on the “Digital Edition” entry type as explained earlier, but in addition it includes the Express Evaluation and Judging Service which allows participants to learn their results significantly faster. This entry method is possible only after the purchase of a “Digital Gift Card” which includes a special nomination ticket that provides Express Evaluation and Judging Service to the Digital Edition of the A’ Design Award & Competition, the “Digital Gift Cards” are usually bought by family or friends who wish to provide a unique gift of “Presenting an Opportunity” for their designer friends. The Digital Edition imposes a reduced design prize where physical items such as trophy, hardcover yearbook, certificate with metal frame would be excluded in favor for decreased nomination fees. Upgrade to Professional edition is possible if you joined the competition with a design that was nominated using a digital gift card however it has a significant cost. Digital Gift Card entry is possible for Professionals, Young Designers, Media Members, Academics and Design Association members but not for Agencies, Governments, Non-Profits or Enterprises. Learn more about Digital Gift Cards. This is a Professional Entry Method using the “Ultimate Gift Card” which makes the winner eligible to receive the complete A’ Design Prize (which includes a series of PR and Publicity services in addition to the metal trophy, design excellence certificate, yearbook publication of best results, gala-invitation as well as physical exhibition), plus it also includes the Express Evaluation and Judging Service in addition to Professional Preliminary Evaluation and Checking Service, thus it is called the Ultimate Gift Card. This gift card is usually bought by friends and family members who wish to support their “creative” loved ones by presenting them a unique opportunity. Ultimate Gift Card can also be bought by individual designers to be used for themselves, especially the Professional Preliminary Evaluation and Checking service included in this package is useful to improve the presentation significantly prior to nomination. Ultimate Gift Card entry is possible for Professionals, Young Designers, Media Members, Academics and Design Association members but not for Agencies, Governments, Non-Profits or Enterprise Account Types. In comparison to the Professional Edition, the entry fee is slightly higher as it includes two extra services. Learn more about Ultimate Gift Cards. Acronym for Join Now Pay Later, this is a Profession Edition entry nomination method that was designed for PR Agencies and Marketing of Enterprises who want to submit up to 40 designs to the competition with a preliminary score of 6 or up. This methods allows you to bypass nomination fees. However, you will be required to pay “Further Fees” if you win. As you would recall, A’ Design Award & Competition is against any “Further Fees” thus we have a “No Further Fees” policy which is explained here: No Further Fees. However in this method, the participant is a risk-averse person from a PR agency or Marketing Department who wishes to nominate a significant number of entries without the initial investment of the nomination fees. This method was invented by A’ Design Award & Competition for PR Agencies who could use it to promote new products with a low initial investment but a high penalty afterwards. It is the most expensive method for taking part in the A’ Design Award & Competition and we strongly advise participants not to choose this method for nominating their designs unless they clearly understand the JNPL very well. Learn more about the Join Now Pay Later method. Why do we have so many Entry Methods? In almost all design competitions worldwide there are two types of entry, these are either classified as (“Concept / Work-in-Progress” vs “Product / Realized Work”) or (“Professional” vs “Young”) or (“Manual Submission” vs “Online Submission”). However, these are actually not “entry types” as they do not actually create any particular benefits or offer additional value to their participants. A’ Design Award and Competition implements a superior participant classification mechanism to create actual benefits for distinct competition entrants. The A’ Design Awards’ different account types addresses the needs and preferences of distinct participants and they are further explained in the “Account-Types” section. On the other hand, what we mean by “Entry Type” as explained in this section is indeed a more complicated concept that relates to additional benefits and unique properties that could be chosen before taking part in the design competition, the "Entry Types" are available for any type of entrants.